More than 450 jewellers from across the globe are showcasing their best jewellery designs and products at the 33rd edition of "MidEast Watch & Jewellery Show" being held in Sharjah. The expo was opened by Sheikh Khalid Bin Abdullah Bin Sultan Al Qassimi, the chairman of Sharjah Sea Ports and Customs, yesterday in the presence of Mohammed Sultan Bin Houwaden, first VC, Sharjah Chamber of Commerce & Industry (SCCI), Saif Mohammed Al Midfa, the director-general of Expo Centre Sharjah and other top officials. “The festival season is round the corner and there are great expectations from both the exhibitors and visitors. I believe the show will once again be able to live up to its reputation of being the finest jewellery show in the autumn that heralds the festival season starting with Eid Al Adha, which is followed by the Indian festival of Diwali as well as Christmas, New Year and the Chinese New Year,” said Bin Houwaden. “The increase in the appeal of gold and diamonds is fully reflected in the growth of the show too, which can successfully lay claim to being the only jewellery fair of its kind that is held twice a year.. this being the second one to be held this year,” he added. During the past two months, the prices of gold have gone up by more than 10 per cent, from around $1,550 per troy ounce in the middle of July to $1,770 by mid-September this year, with a section of analysts predicting that the yellow metal will breach the $2,000-mark by the first half of next year and $2,500 in three years as investors buy the metal as a hedge against inflation. Gold has risen for 11 straight years, reaching a record $1,923.70 an ounce on September 6, 2011. “Gold has brought phenomenal value to jewellery lovers. With the gold prices likely to climb further, this will be the right occasion to acquire the latest designs for the autumn season and the New Year,” remarked Al Midfa. The rising demand for gold and diamond jewellery and watches is the prime driver of the Middle East luxury market, which is set to grow by 15 per cent in 2012, he said, citing a market study. Al Midfa said the exhibitors see this show as the right platform that can reflect the true sales trends that will emerge in the festival season. 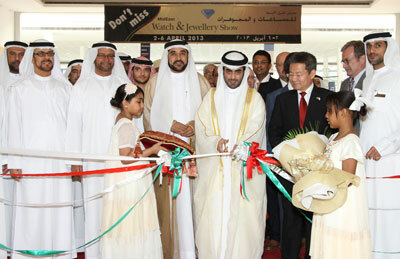 Leading jewellers and brands from Armenia, Bahrain, Brazil, China, Lebanon, Qatar, India, Italy, Japan, Jordan, Lithuania, Malaysia, Myanmar, Saudi Arabia, Singapore, Thailand, Turkey, the US and the UAE are displaying their collections of diamond and gold jewellery, pearls, silver jewellery, gems, precious stones, loose pearls, pearl sets, crystals and watches. The organisers have also lined up fabulous prizes and gifts to attract more visitors. On every purchase of Dh500, shoppers will have a chance to qualify for a daily raffle draw to win exciting prizes.